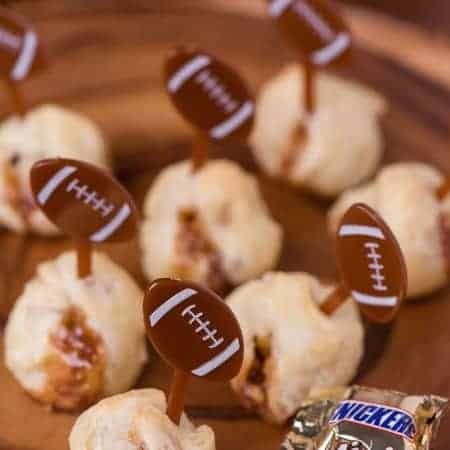 Create the perfect game day sweet treat and impress everyone at your party with these three ingredient Snickers Apple Bites. I am a lover of football. Do I have any idea what the rules are? Nope. Do I know anything about the teams? Nada. Do I even understand the game? Zilch. So why on Earth do you claim you’re a lover of football, Krissy? That’s what you’re asking, right? Well I’ll tell you. 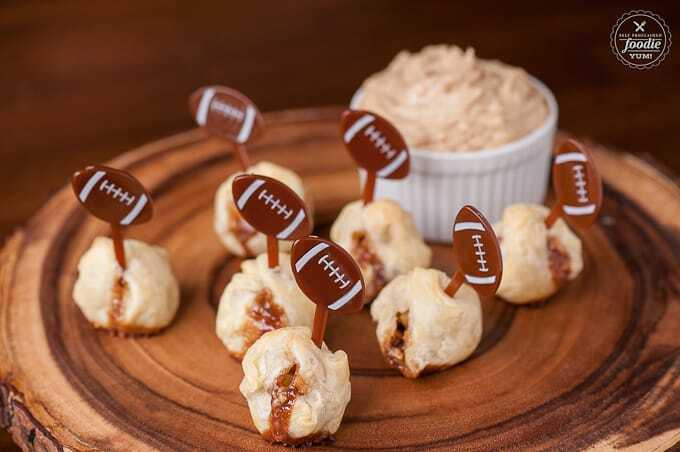 I love football and especially big game day parties for one reason – THE FOOD. For example, everyone loves Snickers. 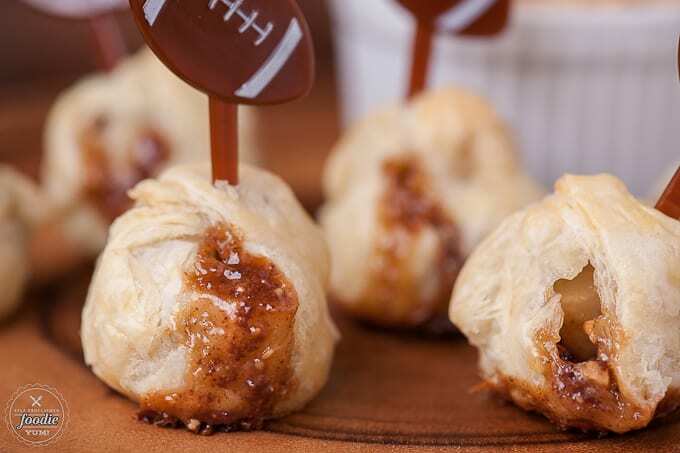 What better excuse can a person have than good old fashioned game day grub to wrap up a tasty little bite of Snickers, pair it with a tart yet sweet and juicy apple like a Pink Lady, wrap the pair in flaky puff pastry, and cook it until it becomes a bite sized melted delicious piece of heaven. I was especially excited when I saw this Snickers variety pack. It had a trio of your traditional mini Snickers but also Snickers with peanut butter and Snickers with almonds. Not knowing what exactly I was going to get in each bite compelled me to eat one after another after another. What? Don’t deny that’s exactly what you would do too! 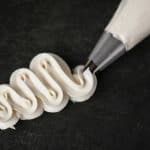 Making these little treats is super easy. The trick is to freeze the Snickers minis to minimize how much they melt in the oven. 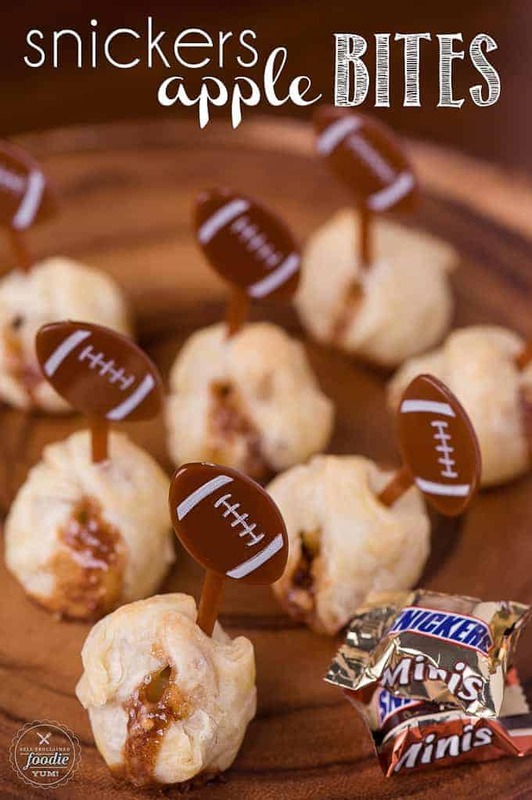 I’ve seen game day treats where people stack a piece of apple on a Snickers and, although the apple-Snickers combo is delicious, why not wrap it up in a little package and transform the ingredients into something amazing? I found the easiest way to wrap them up was to pull up the corners first. 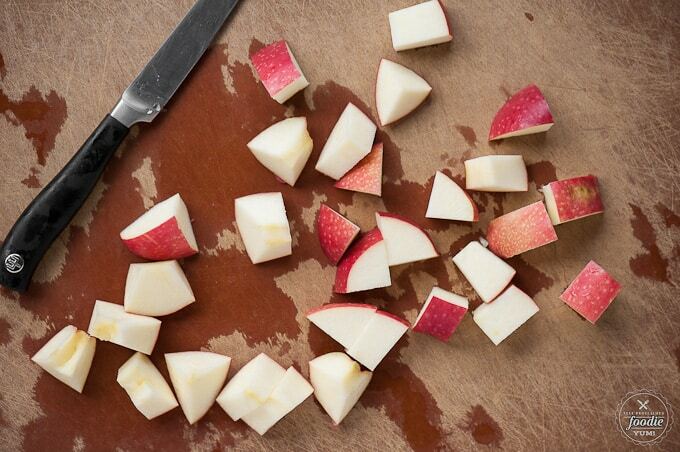 Then pinch the sides together and wrap them around. At this point I wet my finger with water and put a teeny bit of water under each seam to “glue it together”. You want this perfect little package to be wrapped up tightly, but no matter what, you’ll have some of that ooey gooey goodness melt out. 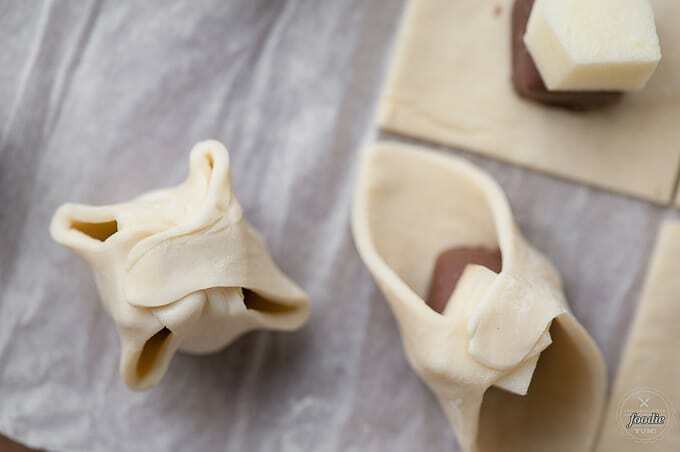 That’s why freezing the Snickers and creating a tight seal with the puff pastry is important – you want to keep as much of the chocolate-y caramel-y treat on the inside as possible. If you’re feeling especially naughty, whip up a batch of some delicious peanut butter dip to serve alongside your Snickers Apple Bites. They don’t need it and already taste great on their own, but at the same time, why wouldn’t you? Don’t they look YUM? 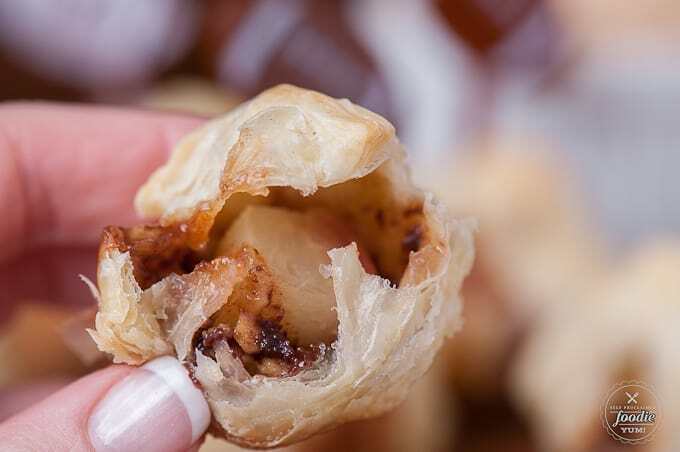 Look at that delicious warm chocolate caramel nutty river of goodness melting out of the puff pastry shell. 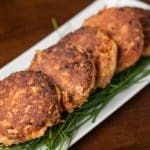 The result is a mouthwatering two bite treat that will have you coming back for more. Your mouth will be so confused (in a good way). Is it apple pie? Is it a warm chocolate caramel nutty sauce inside? 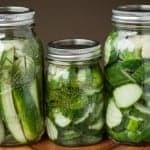 How many should can I eat? So many questions. I’ve shared my my game day dessert recipe with you! I’d love to hear what you plan on making for the Big Game! Leave a comment below. 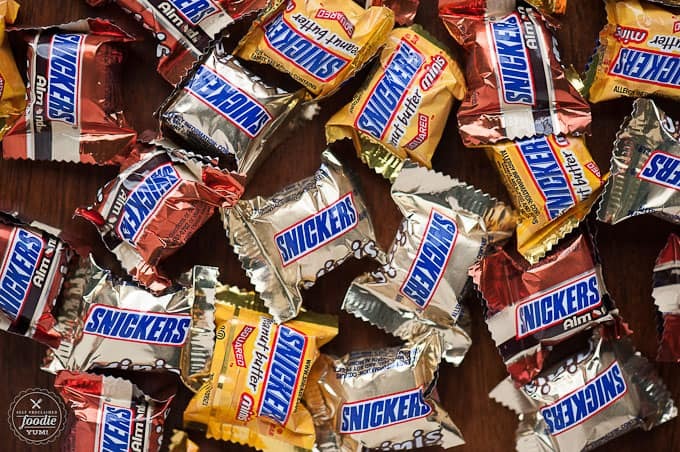 Unwrap SNICKERS minis and freeze pieces. You want them to be as cold as possible when you cook to minimize their melting. Unroll puff pastry sheet on a flat surface. Cut into 16 pieces yielding 2.5 inch squares. Place frozen SNICKERS mini piece on the center of each square and top with an apple piece. 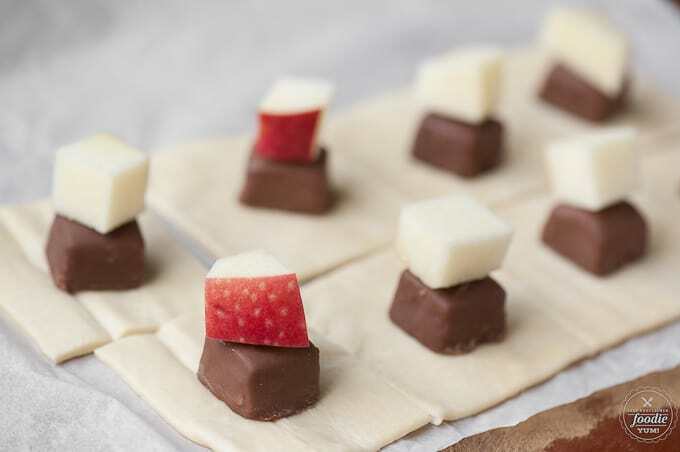 Cover the SNICKERS and apple with the puff pastry by bringing the four corners up to the top and pressing together. 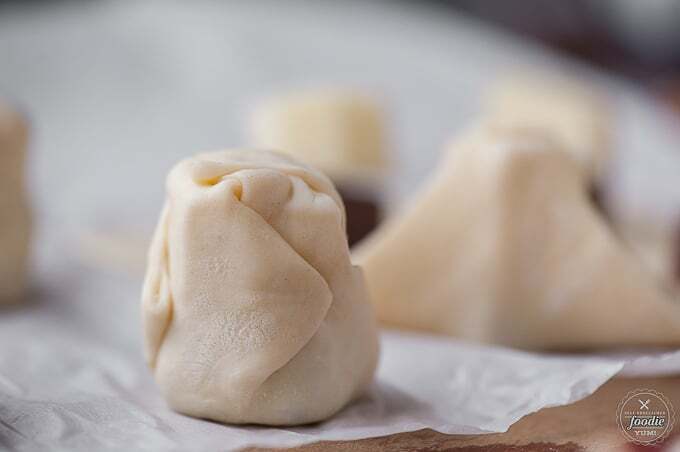 Then seal any openings in the dough by folding and squeezing together. Dip fingers in water and use to help seal dough. 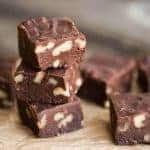 You want a good seal because the SNICKERS will want to melt out of the dough, and this will happen, but a good seal will maximize the amount of SNICKERS that stays in the bite. Bake in preheated oven just until puff pastry begins to turn golden brown, about 15 minutes. Serve warm or at room temperature, alone or alongside some yummy peanut butter dip. OMG, what an incredibly genius idea, Krissy! Love it, and can’t wait to try it!